The story of an honest cop who did his job too well and paid the price. In October 1982, an IRA landmine killed three RUC officers in Co. Armagh. In the following two months, a special RUC squad shot dead six men, giving rise to accusations that the force was operating a "shoot to kill" policy. 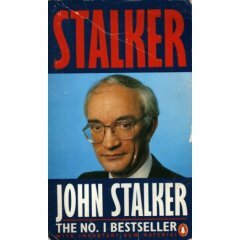 In 1984, John Stalker, the high-flying Deputy Chief Constable of the Greater Manchester Police was appointed to investigate the killings. This is his own account of the extraordinary events that followed. Stalker immediately faced obstruction from the RUC but nevertheless established crucial facts. Four of the six men had been implicated by an informer in the landmine attack. The explosives used had come from a hayshed that was supposed to be under surveillance, the same hayshed where Michael Tighe and Martin McCauley were shot a month later in November 1982. Tighe, a 17-year-old with no criminal convictions, was killed, but Martin McCauley was convicted of possessing rifles from the hayshed at his 1985 trial, even though the police were shown to have put out a false cover story. What the court did not know, but Stalker had by now uncovered, was the fact that the hayshed was bugged by MI5 at the time of the killings. MI5 ostensibly agreed to release this key piece of evidence to Stalker, but his attempts to obtain it were to lead to an epic power struggle with the Chief Constable of the RUC, Sir John Hermon. Ultimately Stalker was forced to produce an interim report concluding that five of the dead men had been unlawfully killed. He found that Michael Tighe might also have been unlawfully killed, but would not make a final recommendation without hearing the hayshed tape. Staker memorably describes how he delivered the interim report in September 1985 to Hermon's deputy, being told that the Chief Constable was not available. A member of Stalker's team spotted Hermon watching events from the window of his office flat. In 1986 Stalker found himself removed from the investigation after a friend of his, Kevin Taylor, became the object of police inquiries in Manchester. The Chief Constable of West Yorkshire, Colin Sampson was appointed both to lead a disciplinary investigation into Stalker and to take over his Northern Ireland role. Sampson questioned Stalker about his use of official cars and about the criminal convictions of some of his acquaintances: a two-year-old conviction for handling a stolen writing pad and sellotape, a twelve-year-old conviction for disposing of a small amount of scrap metal, and a conviction for stealing two pounds of potatoes in 1944. On 16 December 1986, Anderton left Stalker in charge of the entire Manchester force without telling him that the Moors Murder investigation was to be re-opened on that day. Stalker disagreed with the decision to bring Myra Hindley onto the Moors in the middle of winter when the ground would be unrecognisable. He saw the writing on the wall, and left the police, after almost thirty years, in 1987. Stalker's integrity shines out from the page as he recounts his ordeal. In his conclusion he offers a remarkably cogent and objective analysis of the reasons for his downfall. He makes it clear that his investigation would have gone right to the top of the RUC, and that his report was highly critical of the force's procedures and of political supervision over it. He believes that this was politically unacceptable at a time when the British Government desperately needed the loyalty of the RUC in the face of a unionist revolt against the Anglo-Irish Agreement, and that the decision to remove him was made at the highest possible level. Stalker's verdict on his treatment is remarkably philosophical, and in the final pages of this 1988 book, he is prepared to accept that the RUC had implemented many of his recommendations. With the benefit of 20 years of hindsight, that judgement has to be questioned. I don't know who this solicitor was, but the same innuendo was later directed at Pat Finucane, who certainly represented some of the families in the Shoot to Kill cases. A year after this book was written Minister Douglas Hogg told the House of Commons that certain solicitors were 'unduly sympathetic to the cause of the IRA' following a briefing by the RUC. Only a few weeks after that, Finucane was killed by loyalists who had been pointed in his direction by an RUC officer. Perhaps, if John Stalker had been able to complete his investigation, Pat Finucane and many others might be alive today.